Some of the wettest places on the planet are tucked in remote areas. However, there are plenty of inhabited places—surprising, given the weather—that experience a tremendous amount of rain each year, too. Unsurprisingly, the majority of these cities are located in tropical climates, and while some have dedicated seasons when it pours buckets, others see consistent rainfall throughout the year. Here are eight of the world’s rainiest cities—also known as as eight cities to avoid on your vacation if you're seeking sun. With a population of just over 100,000, Quibdó—the largest city in the department of Choco, Colombia—sees a staggering 354 inches (or 29.5 feet) of rainfall each year. Located near the mountains on Colombia’s western side, Quibdó has no dry season and it rains nearly every day (304 rainy days on average). However, the colder season in December gets more rain in the form of drizzle, while the warm season (April) sees more thunderstorms. March has the least amount of rain overall, but it still rains for half of the month. Ironically, despite the large amounts of rainfall, Quibdó often experiences a shortage of usable water due to the lack of reliable water storage systems. On Africa’s northwestern coast, Liberia’s capital city of Monrovia is home to a population of over one million people who get doused in 182 inches of rainfall each year over a coincidental average of 182 rainy days. Monrovia’s rainy season lasts from May through October, but June and July are the wettest. During this time, many roads become impassable due to gobs of red mud. The months between December and February are still very humid and see an occasional showers. Despite the postcard perfect images of swaying palms, beaches, and sunshine, the Hawaiian Islands see some of the highest numbers of rainfall in the world. Parts of the island of Maui, such as Big Bog on the edge of Haleakala National Park and the mountain of Puu Kukui receive 404.4 and 384.4 inches of rain per year(respectively), while Mt. Wai’ale’ale on Kauai sees an incredible 450 inches. When it comes to Hawaii’s cities, the Big Island’s Hilo is the winner with 272 days of rain each year and 126.7 inches falling annually. Buenaventura, another of Colombia’s western cities, lies more than 100 miles south of its rainy sister, Quibdó, but is significantly larger in population with more than 300,000 residents. Buenaventura rests along the Pacific Ocean and has 247 inches (20.5 feet) of rain each year. January through April are the driest months, but in its wettest months (September and October), the city receives more rain than most U.S. cities do in an entire year. Cayenne—the capital city of the only French-speaking nation in South America— rests just north of the Equator and has a tropical coastal climate. The city developed along the shores of the Atlantic Ocean, and in addition to being known for colonial French heritage and Cayenne pepper, it is one of the wettest cities in South America with 147.4 inches of rain each year and 212 rainy days. Although it sees rain throughout the year, Cayenne has two rainy seasons: from December to January and April to mid-July. If your travels will take you to Cayenne anytime soon, you can be the answer to the question "Va-t'il pleuvoir aujourd'hui?" will be a resounding "Oui!". Measuring in with 113 inches a year, Belem doesn’t see the same jaw-dropping numbers as cities in other South American countries, however, it receives rainfall on an average of 251 days a year. 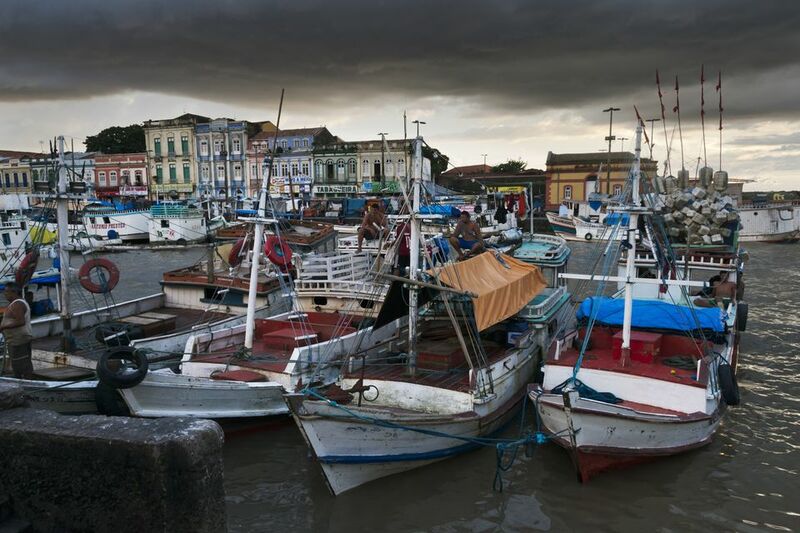 As the capital of the state of Pará, it is a port city that borders the Guajará Bay with a population of around 143,000. Tucked in the northernmost corner just below the Equator, Belem is closer to the rainy city of Cayenne than it is to Rio de Janeiro. The rainy season in Belem runs between December and May— February and March are the two rainiest months. Located just north of the Equator with a tropical monsoon climate, Malaysia is one of the wettest countries on the planet. Kuala Terengganu, a city in the northwest corridor with a population of around 285,000, receives an average of 114.6 inches of rainfall each year. The modern city of Kuala Terengganu grew at the foot of the Terengganu River, which saw extreme flooding in December 2014. Most of the rain in Kuala Terengganu arrives between November and January but the city, which is famous for its "Crystal Mosque," is hot and humid year-round.